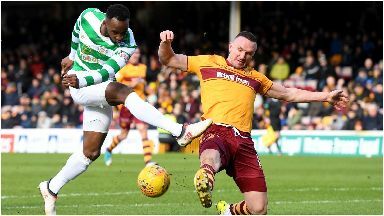 Premiership leaders moved ten points clear despite 0-0 draw against Motherwell. Brendan Rodgers was left bemoaning Celtic's lack of cutting edge in their 0-0 draw at Motherwell. The champions dominated, particularly after home defender Cedric Kipre was sent off just before half-time, but couldn't find a way through. Scott Sinclair missed their best chance just minutes from time when he went clean through but saw his effort blocked by Richard Tait. However, the manager said the Premiership leaders were going into the international break in great shape as they moved ten points clear at the top of the table. Rodgers told BBC Sportsound: "You have to respect that the game changes when they go to ten men. "I was pleased with the approach but we needed to be more incisive in the final third. "It was a difficult day with the wind and the pitch but we got a point and that puts us ten clear with eight games to. "We're in a great position when we come back from the international break."